Under no circumstances should fiddleheads be eaten raw. Please note that proper handling and thorough cooking of fiddleheads can reduce the risk of foodborne illness. Remove as much of the brown papery husk (parchment-like paper covering) as possible, using your fingers. Wash the fiddleheads in several changes of fresh cold water to remove any residual husk or dirt. Cook them in a generous amount of boiling water for 15 minutes or steam them for 10 to 12 minutes. Discard water used for boiling or steaming fiddleheads as it may contain the toxin. Follow these instructions before sautéing, frying, baking or making other foods (e.g. soups, casseroles) using fiddleheads. Clean fiddleheads as outlined above. Blanch fiddleheads for two minutes. Plunge fiddleheads in cold water. Drain. Pack drained fiddleheads in freezer containers or bags. Store them in the freezer for up to one year. Follow the complete cooking steps outlined above before serving. Preserving fiddleheads with a pressure canner is not recommended, as safe process times have not been established for home-preserved fiddleheads. Please click here for more info about how to safely enjoy fiddleheads. Health Alert: Wash and Cook Fiddleheads to Prevent Illness. Above, Fiddleheads. Residents of Toronto are being reminded to thoroughly wash and cook fiddleheads before they are consumed to avoid illness. Fiddleheads are curled, edible shoots of the ostrich fern and are commonly eaten at this time of year as a seasonal vegetable. “Recently, five cases of illness associated with fiddleheads have been reported to Toronto Public Health. To prevent further illness in the community, it is important to thoroughly wash and cook fiddleheads before eating them,” said Jim Chan, Food Safety Program Manager for Toronto Public Health. Cases of temporary illness from eating raw or undercooked fiddleheads were first reported in 1994, and additional cases have been reported periodically since then across Canada. While the cause of this temporary illness is not known, Health Canada believes it is most likely the result of an unidentified natural toxin present in the fiddlehead. Illness associated with consuming fiddleheads is uncommon. Symptoms of illness appear within 30 minutes to 12 hours of eating raw or undercooked fiddleheads and typically last for less than 24 hours but may last as long as three days. Symptoms may include diarrhea, nausea, vomiting, abdominal cramps and headaches. • Never eat raw fiddleheads. • Remove as much of the brown, papery husk as possible. • Wash the fiddleheads well using fresh, cold water. 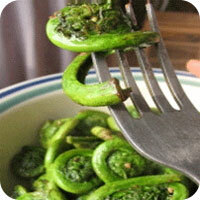 • Cook fiddleheads by boiling them for 15 minutes or by steaming them for 10 to 12 minutes. • Water used for boiling or steaming fiddleheads should be discarded as it may contain the toxin. More information about how to safely enjoy fiddleheads can be found on Health Canada’s website at http://www.hc-sc.gc.ca/fn-an/securit/kitchen-cuisine/fiddlehead-fougere-eng.php. People who believe that they may have become ill as a result of eating fiddleheads should contact Toronto Public Health at 416-338-7600 during business hours or after hours at 3-1-1, or see their family physician.